The new Advanced Projects division of United Technologies Corp. on March 26 published a technical paper describing its efforts to develop a hybrid-electric flight demonstrator, under the name of Project 804. 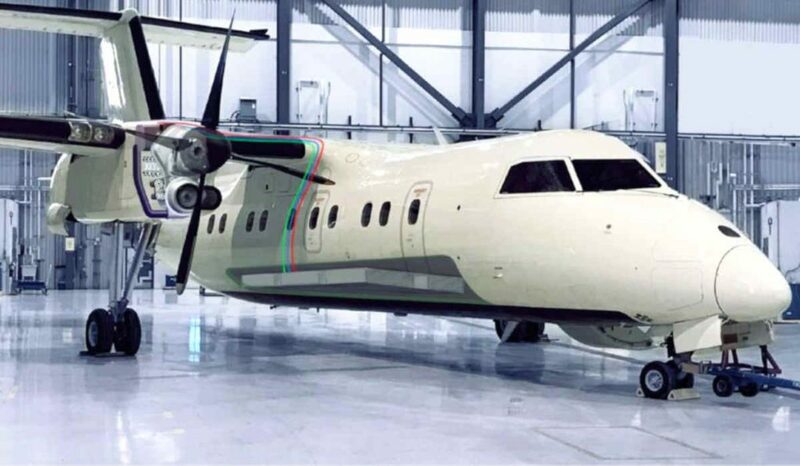 The development is significant because it targets the conversion of a regional-size passenger aircraft, specifically a twin turboprop Bombardier Dash 8 Q100 that is expected to fly in 2022. The name Project 804 was chosen by United Technologies Advanced Projects (UTAP), because 804 represents the straight-line mileage between the two facilities working on the hybrid-electric demonstrator, including Pratt & Whitney’s facility in Montreal, Quebec, and a Collins Aerospace facility in in Rockford, Illinois. UTAP itself was formed just weeks ago. Jason Chua, executive director, Advanced Projects, UTC, describes why in a recent LinkedIn post: “As is the case with other Fortune 50 companies, our size can burden us from competing against smaller, more nimble startup companies, and their rapid technological pace. Simply put, in today’s technologically advanced world, we are vulnerable to disruption. The X-plane designation typically relates to NASA’s naming of important experimental aircraft and rockets dating back to 1947 and the X-1, which is the rocket-powered airplane that Chuck Yeager flew to become the first human to fly faster than the speed of sound. NASA’s newest experimental aircraft, designed with quiet supersonic technology and intended to help open a new era in faster-than-sound air travel over land, is known as X-59 QueSST. UTAP’s March 26 X-plane technical paper, called The Pragmatic Future of Hybrid-Electric Flight: A Technical Analysis of United Technologies Advanced Projects’ X-Plane, was authored by Jean Thomassin and Greg Winn of UTAP. They explain their X-Plane – again based on a Bombardier Dash 8 Q100 – will be re-engined on one side with a 2-megawatt-class propulsion system, which is to be augmented by a battery-powered electric motor that can provide one megawatt of power in parallel. The technical paper explains this parallel configuration between engine and electric motor is well suited to handle the power ratio required of a regional turboprop, which includes the need for high takeoff power to carry large payloads but then flies relatively slowly under low power. The paper states the full system capability of the X-plane will be within the 2-megawatt power class for the 30-50 passenger regional turboprop market.